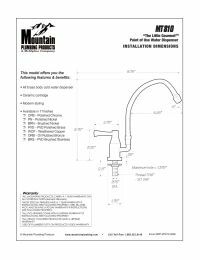 Mountain Plumbing Lead Free MT810 Point of Use Drinking Faucet is a cold water dispenser. The faucet can be used with many applications such as food prep, bar prep, and for use with filtration systems. It is available in multiple finishes which allows you to find the perfect design for your bar, kitchen or even bathroom! Note: This faucet contains more than 0.25% lead and is illegal to use in any plumbing system providing water for human consumption anywhere in the United States.